New translations unit provides Scientology materials in more than 80 percent of the world’s indigenous dialects. Since its inception, Scientology has been a religion about inclusion. One of its most fundamental achievements is its consistent availability to cultures and continents around the globe, including Europe, Asia, Africa, North America, South America and Australia. But it was the release of L. Ron Hubbard’s Basics Books and Lectures in 2007 that truly took Scientology to the next level in its accessibility. Emerging from the largest global translations project in Church history, the Basics came out in 17 languages, and later, all Beginning Books of Dianetics and Scientology were made available in 50 languages. That linguistic capacity of Scientology took another leap in 2014 with the October dedication of the Ideal Continental Liaison Office for Europe (CLO EU) in Copenhagen, Denmark. The central European headquarters—situated on a three-acre campus in Denmark’s Glostrup Commune, some 20 minutes from the Copenhagen city center—features a bank of six state-of-the-art audiovisual studios that expands the overall language translation capability up to 50 languages for all Church materials. The languages run a vast geographic spectrum from Albanian to Arabic, Chinese to Czech, Finnish to French, Hebrew to Hungarian, Polish to Portuguese, Slovenian to Swedish and Ukrainian to Uzbek. Creation of the expanded translations unit in Europe stemmed from the growing demand for Dianetics and Scientology Scripture made available through the two major Scientology Scriptural initiatives—commonly identified as the Golden Age of Knowledge and Golden Age of Tech Phase II. Golden Age of Knowledge, completed in 2009, capped more than 25 years of research, recovery, restoration and verification of all manuscripts and recorded lectures from Scientology Founder L. Ron Hubbard. Golden Age of Tech Phase II, released in 2013, is the culmination of a massive project launched by David Miscavige, Chairman of the Board Religious Technology Center, to ensure the standard application, availability and longevity of all Scientology Scriptural material. Jason Newman, an audiovisual tech expert who was part of the team that installed the new unit in Denmark, noted that the facility, with six recording booths, triples the capacity of the other Scientology translation facility outside the United States, located in the Church of Scientology of Kaohsiung, Taiwan. “But it’s about more than just being able to have six translations done simultaneously,” said Newman, who is now helping to prepare the translation operation at Scientology Media Productions, the Church’s communications hub in Hollywood scheduled to open in 2015. Newman was one of five techs tasked with installing the sophisticated production equipment that makes possible all of this translation from English. Besides simply procuring the custom-made gear, it involved extensive testing to ensure the recordings of the individuals speaking the translated words of Mr. Hubbard capture the same high level of clarity and quality that has driven the meticulous restoration of the Scientology Founder’s original audio recordings. Ladislav Pavlik, president of Hubbard College of Administration in Slovakia that teaches and grants degrees in the administrative technology developed by Mr. Hubbard, says the translations are vital. “Because of this administrative technology we successfully expanded and teach about 2,000 people each year, and we aspire to become a leading educational institution in our nation,” he told Freedom. While at one time the only Scientology translation studio was housed at Golden Era Productions in Southern California, soon one will be in operation on every continent, Newman says. The bank of digital studios at CLO EU is in operation around the clock, as are the four at Golden Era. Worldwide, the program to translate L. Ron Hubbard books and lectures is massive in scope. 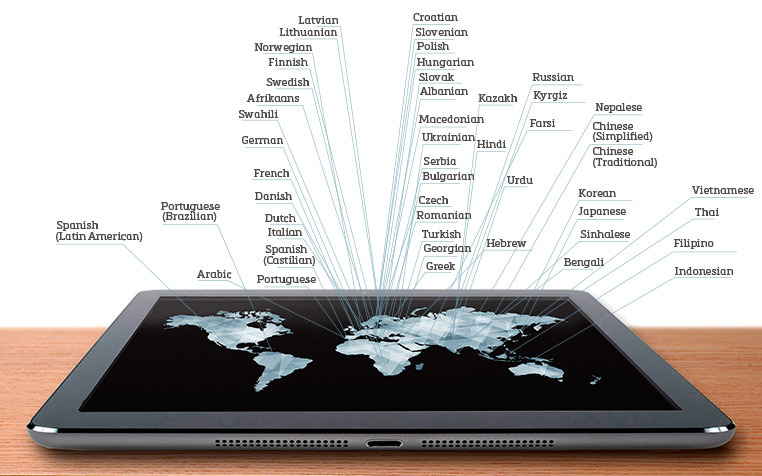 It comprises more than 1,000 translators across 50 nations. Of those living in the zone covered by CLO EU, just 70 million people (of 2.9 billion)—or about 2.4 percent—list English as their native tongue. While the CLO EU translations unit is based in Europe, it is responsible for languages spoken well outside of that continent’s borders. Those include 17 languages in the Indian subcontinent alone, including Bengali, Farsi, Hindi, Sinhalese and Urdu. So the next time you see someone in the Metro in New Delhi reading Dianetics in Punjabi, you’ll know it came from the translations unit, which has in effect converted the words and Scripture of Scientology into a distinct international language.